I’m going to tell you a secret. 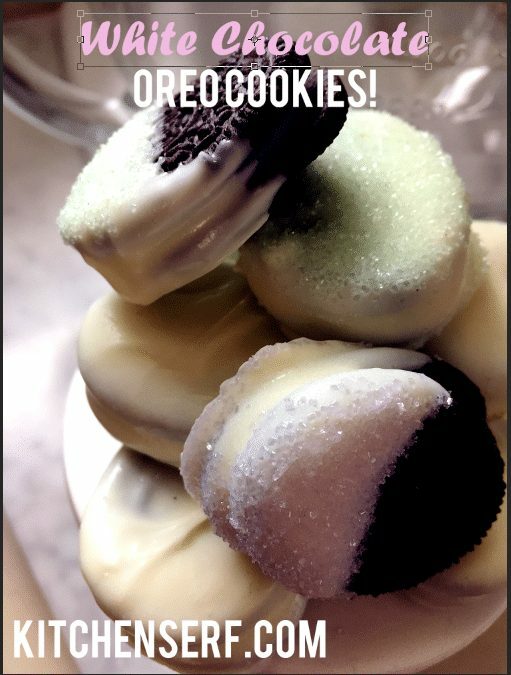 The only thing better than Oreo cookies are Oreo cookies covered in white chocolate! I know, shocking, isn’t it? Are you a rabid white chocolate fan? You might like White Chocolate Raspberry Cheesecake Pie. You also might like Graham Cracker White Chocolate cookies. This post is not sponsored by Oreo but it does contain affiliate links, which means if you click through and make a purchase, I’ll make a small commission. See disclosure. 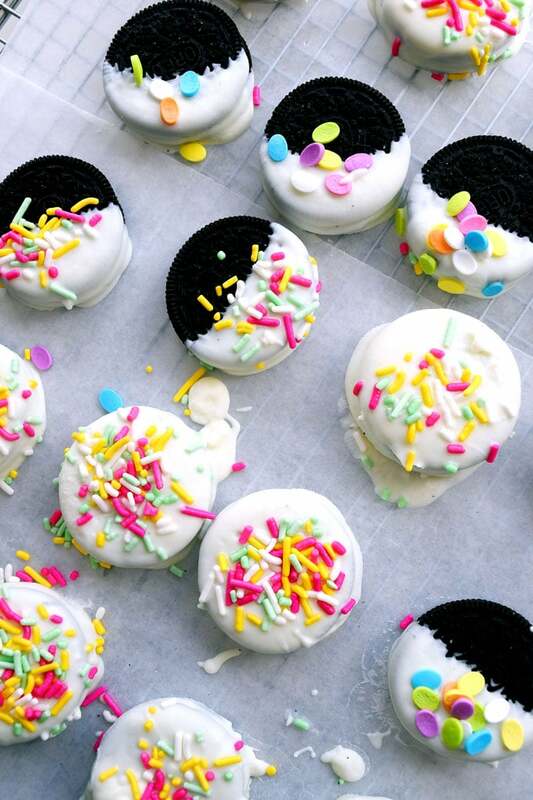 The only thing better than an Oreo is an Oreo dipped in white chocolate. Trust me, I know. This recipe takes just two ingredients and a few minutes to make. Your family will devour them in moments! I decided to dip oreo cookies in melted white chocolate after spying egg-shaped Oreo cookies at the grocery store. I knew I had a couple cups of white chocolate disks left over from holiday baking. By the way, I buy most of my baking ingredients at Sam’s Club and I’ve made a price list for you. The only thing you need to know how to do for this recipe is melt white chocolate. By that I mean melt the white chocolate at a low temperature slowly using a makeshift double boiler on a stovetop. Here’s my makeshift double boiler: a glass bowl set over a sauce pot of simmering water. Don’t go buying a double boiler unless you make candy on the regular. My homemade version of a glass bowl over a sauce pot will work just fine for you. Please ignore the condition of my sauce pot unless you are a manufacturer then send me something pretty to use please! 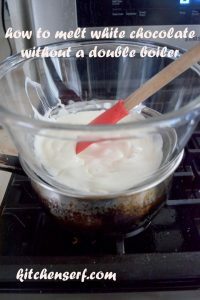 Use a double boiler or my make shift version of a double boiler to melt chocolate without a microwave. In fact, even if you do have access to a microwave, I would not suggest using it to melt chocolate. Chocolate, especially white chocolate, can scorch easily. Look ma, the white chocolate is all melted but I did have to use my hands to give the white chocolate disks the occasional stir. Also, don’t look at my stove, which needs to be scrubbed! Melted white chocolate + Oreos are all you need for a holiday sweet. 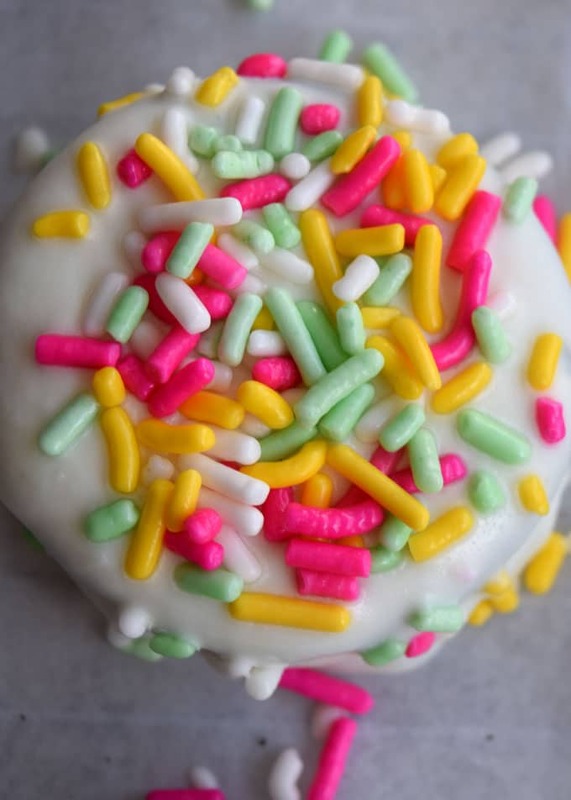 Add sprinkles or pastel sanding sugar if you want to gild the lily. 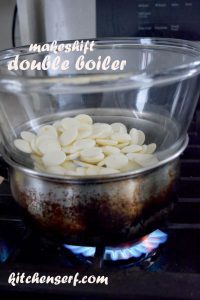 If after melting your white chocolate disks or chips, the chocolate seems too thick, you can thin melted white chocolate by adding a half a teaspoon of vegetable oil or canola oil. Add a teaspoon of vegetable oil. However, take care doing this, you don’t want to add so much oil that you affect the flavor and the consistency of the chocolate. Set a sauce pan with about an inch of water on cook top. Bring water to a roiling boil then turn down to simmer. Put white chocolate in a medium to large, clean, dry glass bowl. Place the glass bowl on the sauce pan. Be sure the bottom of the glass bowl won't dip down into the pan so far that it touches the water the pan. You don't want any water in the bowl with the white chocolate or touching the glass bowl. Water, even a drop, will make the chocolate seize up. Seizing up means the chocolate won't melt properly and you'll have to throw it out and start over. Using a rubber spatula or a wooden spatula, stir the white chocolate disks or chips, every two to three minutes, being sure to scrape the bottom of the bowl. Depending on how hot the water is and how warm or cool the white chocolate is when you began the process of melting it, this step should take ten to 15 minutes, approximately. 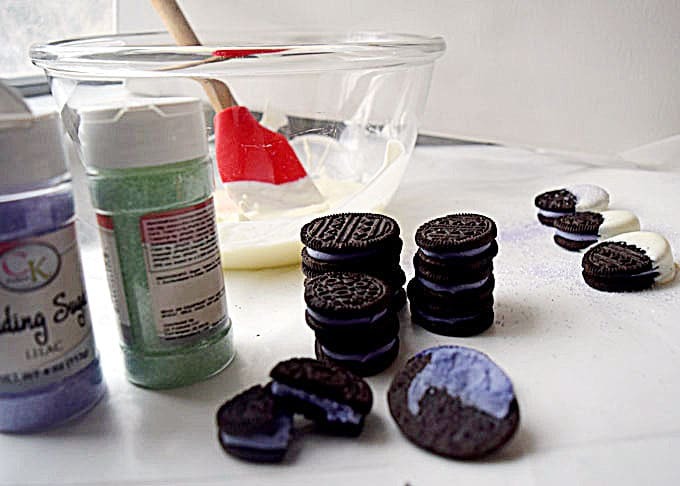 Meanwhile, put a few sheets of wax paper on your counter or kitchen table and open the package of Oreos. Once the chocolate is melted, turn off the stove top and using potholders, move the bowl of melted chocolate to your Oreo/wax paper work station. Using a large fork, dip each cookie until covered in white chocolate, give a shake and set on wax paper. If you're going to sprinkle or sugar the chocolate-covered Oreos do so immediately after dipping in the chocolate. Let cookies rest on wax paper until the chocolate has set. Depending on the temperature and humidity in your kitchen, it may take ten to 20 minutes for the chocolate to set. 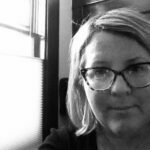 If you're working in a hot climate, these may not set without refrigeration. If that's the case, store them in the fridge. If you're not in a hot, steamy kitchen, you can store these cookies in a cookie jar or a plastic bag for as much as two weeks-however they won't last that long. Your turn, tell me how you like your Oreo cookies. Have you ever melted chocolate? What’s your method for melting chocolate?